Welcome to another day in the This is Halloween Series. Are you getting ready yet? Yes, I skipped last week – it was a nutty work week, but I’m back on schedule. While this is such an easy one, I’m almost embarrassed to share it, I”m sharing it anyway, because Pottery Barn is selling a set of three for $119! 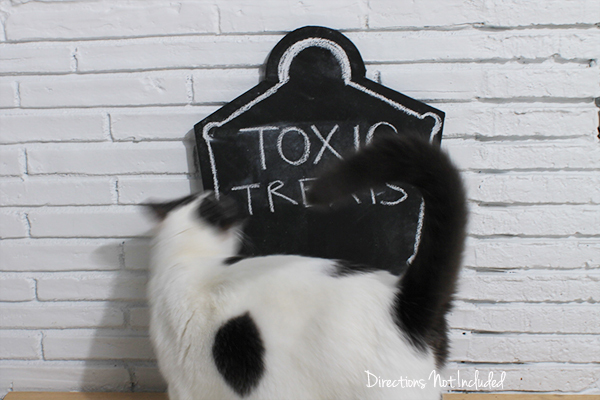 Chalkboard tombstones for $119?! Not for this DIYer. Plus, any of you can do the same for a fraction of the cost. 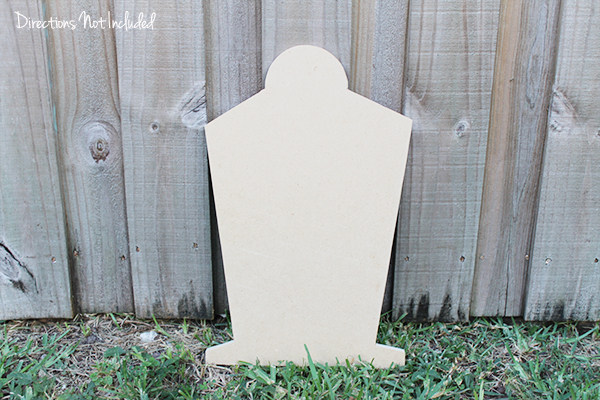 I made a bunch of tombstones last year with leftover plywood for the front of our house. This one is a bit different and perfect for indoor decor. With some leftover MDF I had on hand, I sketched out a simple shape based on the one I saw on the Pottery Barn website. You can buy a piece of MDF at your local hardware store for not much. I used the jigsaw and belt sander at Ray’s studio at school to clean this up, but you can easily do it with a handheld jigsaw and sander. You can even use sandpaper. You don’t need to get fancy with these things. As a crafter/blogger, I clearly hoard chalkboard paint. I used what I had, to give the tombstone a few coats of paint. You all know what chalkboard paint looks like so I’m skipping that. I primed the chalkboard with some chalk. As you all already know, this means making a mess of your space by rubbing chalk all over your piece, then cleaning it up. Or as I like to call it, making a huge mess with chalk. And there you go. 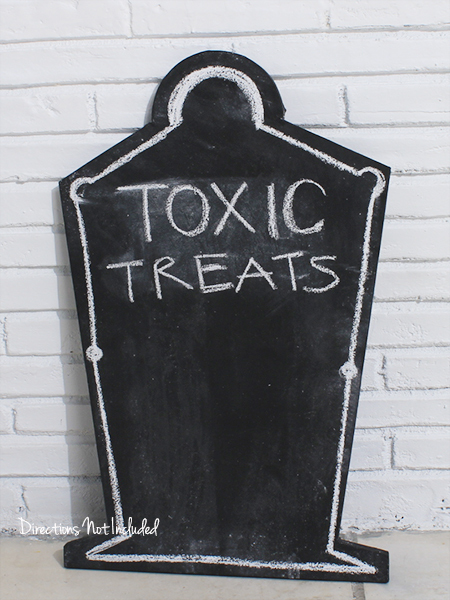 Your very own knock off Pottery Barn chalkboard tombstone. 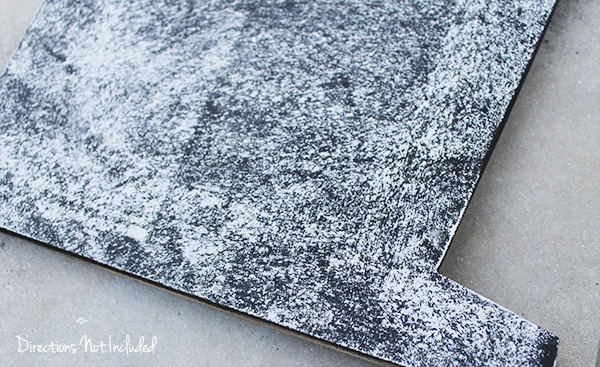 Since MDF is so lightweight, that it is perfect for indoor crafts and decor. I’m using it for now for our bar menu for the Halloween party I’m planning. Lemur is clearly intrigued as to what toxic treats I will be serving. We all need a spooky drink come Halloween, right? super fun! i love toxic treats- red wine. and i will be voting- saved the post to get to tonight! Lemurrrrr! I’m always ready for a toxic drink! Love it! very simple, yes, but sometimes the simplest ideas are the best. I might just need a whole graveyard of these in the front yard–the kids would have so much fun with them! So cute! You make all your projects sound so easy! I look forward to the day I have a garage again and can get out a saw and start creating!